Are you a Man of Sperrin? Man of Sperrin 2019 is more about panoramic views than the pain of previous years. Don’t be under any illusion the new 69 miles / 110km route with 5,357 feet of climbing is still a tough day in the saddle. Event organisers have listened to cyclists’ feedback over the last two years and so this year the route is different but still demanding. The beast of Benbradagh has been put to bed this year. There are two routes: the 5 peak challenge and the 2 peak challenge. Five Peaks: The Full Majesty of the Sperrins. One of Ireland’s most idyllic and dramatic landscapes, The Glenelly Valley, has been included in the new five peaks route for 2019. Scoured out by giant sheets of ice, this cycling paradise combines with The Birren, Brown Knowes, Davagh and The Sperrin Road climb to create one of the most challenging, yet rewarding, sportive course in Europe. So if a sportive on flat roads no longer holds much of an appeal, maybe it’s time you took on a challenge that is distinctively different. Two Peaks: Entry Level Event. Not just ready for the full Five Peaks challenge yet? No problem. Try our entry level route: Man of Sperrin: Two Peaks. With two demanding climbs and some spectacular views it might just whet your appetite to come back next year and have a crack at the full course! Encompassing The Birren and The Brown Knowes, Two Peaks is still a very demanding entry level route. Cyclists who don’t show due diligence by doing the necessary training will be in for a rude awakening. Before the Birren evolves into a long, steady drag, the early section includes a particularly nasty incline which can force even top class cyclists out of the saddle. The Brown Knowes will also send heart rates soaring through the roof. After cresting the Birren and before the Brown Knowes, riders can take a breather in St Eoghan’s Primary School in Moneyneena where refreshments will be served. The highlight of Two Peaks is undoubtedly the long, panoramic descent from the summit of the Brown Knowes. After 1000ft of steady climbing the breath-taking views of Banagher Dam, Lough Foyle and the surrounding Sperrins will be richly savoured, as will the pan flat surface from Banagher to Owenbeg! Can I fundraise for charity? Go to Virgin Money Giving, they’re a not-for-profit facility (more of your money goes directly to your charity) and follow the simple instructions. Try to use Gift Aid if possible so your cause benefits even more. Pick a charity close to your heart and which means something special to you, your friends and/or your family. Man of Sperrin is a formidable challenge which comes with a kicking feel good factor, one which is now doubled through your charity efforts. 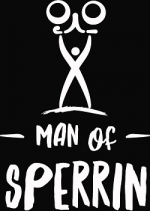 Set up your page, e-mail everyone you know and tell them you intend becoming a ‘Man of Sperrin’. Then ask them to sponsor you. Social media is also a great tool to spread the word so use our official event hashtag of #MOS17 to join the conversation. We have a number of registration options for each of the two challenges. N.B. The earlier you register, the cheaper it is. Includes use of Owenbeg facilities including showers, changing, toilets and parking. Also included is hot food after the event, refreshments on the course, bike maintenance, sports massage and free photos as memories of the day. Includes event branded t-shirt and use of Owenbeg facilities including showers, changing, toilets and parking. Also included is hot food after the event, refreshments on the course, bike maintenance, sports massage and free photos as memories of the day. As well as guaranteeing your place online pre-entry will save you time on the day of the event allowing you to simply pick up your registration pack from the ‘Pre entered collection point’. On the day entries are available at the event as long as the event has not sold out prior to the event day. On the day entries are subject to an additional £5.00 per person surcharge. We don’t use timing chips as it might encourage cyclists to take unnecessary risks to achieve a faster time. Most smartphones and bike computers can link up to Strava if you wish to compare your time with others post-event. The event is organised by volunteer members of Club Derry alongside the Train Station Gym, Maghera. Club Derry is a not for profit organisation and is the the largest single sponsor of Gaelic Games in County Derry. Club Derry members commit to an ongoing financial contribution to coaching and games development in the county, as well as helping fund infrastructure projects such as the flagship training facility at Owenbeg Centre of Excellence. The majority of the registration fee is used to help ensure that the event is a safe, memorable and enjoyable experience for all. Funds raised through commercial sponsorship helps with upkeep and maintenance of the Owenbeg centre. In 2018, we also made a £1000 donation to our chosen charity of Charis Cancer Care, and have plans to follow suit in 2019. How can I help with the event? In the Man of Sperrin team our ambition matches our landscape for grandness. The Sperrin Mountains are one of Ireland’s best kept secrets, and whilst we don’t want to diminish their remote splendour, we do want people to know how wonderful they are, particularly for cycling! So if you’re over 18 years and as passionate about the terrain as much as we are, you’re welcome to join us as a Man of Sperrin volunteer. We have an experienced and talented core group of volunteers available. However, we need more to deliver the participant experience to the level we believe best reflects our event for the long term. A sense of pride and identity – Become a Volunteer of Sperrin! We require volunteers to help with marshaling, meet and greet, catering, rest stops, photography and media. If you feel you have something to offer and want to come on board, drop us a message through the website or contact us on our social media channels. The official on-road time is 9am. We will publish further instructions and timings regarding registration and pre-event details in due course. What do I do if I need info/help on the day? For general help and assistance just ask a volunteer, they’ll be easily identified by their event t-shirt or high viz. You can also flag down a support car or motorbike marshal. For emergencies use the numbers provided on your wristband. Do I have to be in a cycle club? Do I need to carry a bag or rucksack with food and clothing? Absolutely not. A bag isn’t essential, will probably slow you down and use up valuable energy. Travel as light as possible. Use your jersey pockets to carry stuff. If you feel you need to carry lots of things use a bar bag or pannier bag instead. Can I do it on any type of bike? As long as it’s roadworthy… yes. We’d recommend a road bike or a hybrid bike with skinny tyres – they’ll cover the ground a lot quicker and use less of your energy. The heavier the bike and the chunkier the tyres – the longer and tougher it gets. It is already tough enough! Is there a time limit to complete the event? There’s no time limit – however we expect the majority of riders to be finished between 11:00 and 1530. We will have out riders and marshals on the course so no one will be left on the routes and the facilities will be available until every one is finished. Will I get my registration number/pack sent out in the post? No – we do everything on the morning of the event. When you register on-line you will get a receipt of payment. At that stage we have your name and address on the data base. You simply come to the sign-on area on the morning, find your name on the sign-on sheets, sign on, pick up your wristband, helmet numbers and remind yourself once again of the safety instructions before going to the start line. Can I register over the phone or by post? No. Everything is done on-line through the website.. If we have not already reached our maximum number of entrants we may accept entrants on the morning of the event for registration. Please note enrty may not be guaranteed and there is a £5 surcharge for entry on the day. I haven’t cycled much – will I be able to make it? We have chosen 2 very different challenges to cater for different abilities. Our 5 peak challenge is an extreme course designed to test battle hardened cyclists. For those with not as many miles in the tank and for those with a base level of fitness and new to cycling we offer the scenic route. Tough, but worth it! What facilities will I expect to find on the day? Do I need a road cycle license? Our event is registered as an offical Cycling Ireland event. ALl participants with a cycling ireland membership can ride under their own license. We will facilitate all non members the opportunity to acquire a one day license and associated insurance for a cost of £5 – the form will need to be filled in on the day. There will also be an opt out option those wishing to opt out will be reuired to sign a waiver form on the day prior to participation. How do I keep up to date with all announcements and communications in the lead up to event day? All announcements and updates not already on the website will be done on this website and on facebook page and twitter. Please like and follow the following Facebook and Twitter links for updates and to help us promote the event. Where Is Owenbeg Centre of Excellence? Owenbeg Centre of Excellence is located just outside the town of Dungiven, County Derry. Just 17 Miles from Derry and 53 miles from Belfast. There is ample free parking inside the Centre grounds. Owenbeg is situated at the base of the Roe Valley, in the magnificent Sperrin Mountains. As a result, the surrounding areas have a number of quality guest accommodations. Endenroe Bed & Breakfast, in Dungiven town, is just 2 miles from Owenbeg and a 3 minute drive. Or if you prefer to stay somewhere more rural, Killunaght House, situated in the foothills of the Sperrin Mountains, offers luxury Bed and Breakfast accommodation for visitors to County Derry. It is just 3.5 miles and a 6 minute drive from Owenbeg. Hillside Guest Accommodation, is also a 6 minute drive and 3.5 miles from Owenbeg, at Gortnaghey (close to Foreglen). The City of Derry Airport is the closest airport to Owenbeg at a distance of 16 miles. Belfast International Airport is 40 miles away and Belfast City Airport 55 miles. In the nearby town of Dungiven, there are a host of bars, restaurants, coffee shops and Fast Food outlets, where you can grab a bite to eat. Silky’s Bistro situated in the heart of Dungiven, is a family run restaurant catering for breakfast, lunch and dinner. B Tea 47 has a lovely atmosphere and is a great place to pop in for a nice tea or coffee as well as maybe a scone.